« It’s been a long time! 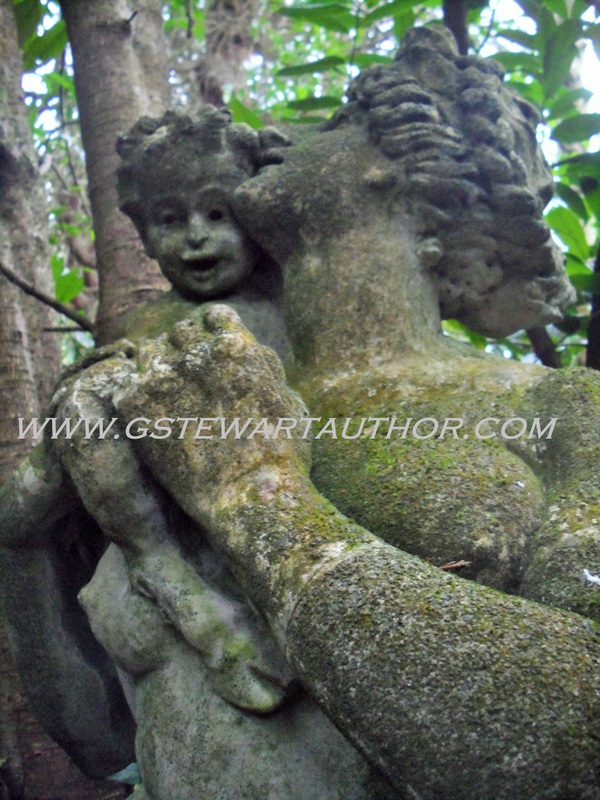 It took me a while and guidance from someone familiar with the estate, but finally I found the statue of a mother and baby, hidden in the gardens of a country mansion house. To give readers an idea of the scale of the task, the garden grounds included lakes and a miniature island village (now sold to form a country park for the public) and 330 acres that were recently sold to create a golf course, and there is still a fair bit of land left! The statue itself was already placed deep in the foliage of the garden and, having been abandoned over ten years ago, it is only accessible by ripping yourself apart pushing your way through thorn bushes, but it was worth the effort. So what’s so special about this statue? The answer to this lies in the mystery surrounding it. The garden was extensively decorated with statues, but this one was not in a prominent position. Why? The story is that one of the senior males in the house got one of the maids pregnant. Fearful that his wife would find out, he hid the pregnancy and spurned his lover. Unable to deal with the rejection, when the baby was born the maid threw herself from the roof of the house, with the baby in her arms. An alternative version tells that the father had the baby disposed off, leading the maid to take her own life. Full of remorse, the father had the statue made of his love and their child, and hid it in the garden where no one would know where it was so he could spend quiet time contemplating what might have been if he had acted differently. The story however does not end there. His wife found the statue and the story came out. She allowed the statue to remain but had the stonemason make some alterations. Hoofed feet were added to the baby to represent the fact it was born out of sin. 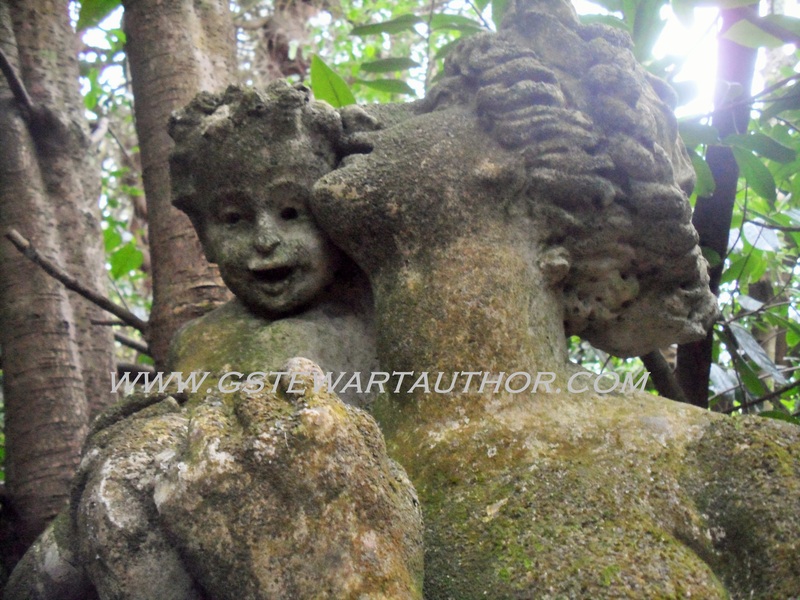 The ghost of the mother can still be seen and heard wandering through the house and gardens, searching for her baby. While this may be folklore, and some suggest the statue is the goddess Penelope with her son, Pan, the story has persisted through the years. An anonymous historian once stated ‘truth is in folklore, you’ll not find lies carried down the years’, so just maybe there is truth in the tale of the married man and his jilted mistress. This entry was posted on March 2, 2015 at 7:34 pm and is filed under Uncategorized. You can follow any responses to this entry through the RSS 2.0 feed. You can leave a response, or trackback from your own site. I lived in the cottage only a few yards from the statue from 1950 until 1968. I worked as a gardener in the grounds during the summer breaks and was well acquainted with the history of the house and the grounds. I could see the statue only a short distance from my bedroom window and my father continued to live in the cottage until 1983. What a great place to have lived Ken. I first heard the story while growing up locally in the 1970s, but you are correct in that these tales often become more popular (and sometime embellished!) once there is a creepier feel to the place. I just hope the building is soon restored to its former glory and the statue placed in a more visible location.